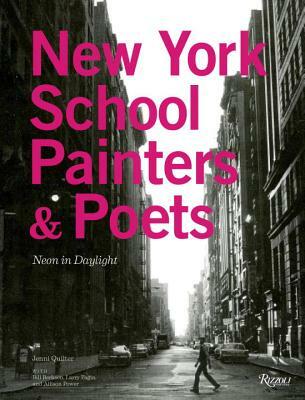 New York School Painters & Poets charts the collaborative milieu of New York City poets and artists in the mid-twentieth century. This unprecedented volume comprehensively reproduces rare ephemera, collecting and reprinting collaborations, paintings, drawings, poetry, letters, art reviews, photographs, dialogues, manifestos, and memories. Jenni Quilter offers a chronological survey of this milieu, which includes artists such as Willem de Kooning, Robert Motherwell, Alex Katz, Jasper Johns, Fairfield Porter, Larry Rivers, George Schneeman, and Rudy Burckhardt, plus writers John Ashbery, Bill Berkson, Ted Berrigan, Joe Brainard, Edwin Denby, Larry Fagin, Frank O’Hara, Charles North, Ron Padgett, James Schuyler, Anne Waldman, and more. Jenni Quilter is an academic and non-fiction writer who teaches at New York University. Allison Power is an editor at Rizzoli New York. Bill Berkson is a poet, critic, and professor emeritus at the San Francisco Art Institute. Larry Fagin edits the Adventures in Poetry books and Sal Mimeo, a literary magazine. Carter Ratcliff’s books on art include Out of the Box: The Reinvention of Art, 1965–1975 and Andy Warhol: Portraits.